Toyota today introduced the refreshed Liva. The stylish, dual toned new Toyota Liva features rear Roof Spoiler, Black Grille and ORVM (Outside Rear View Mirror) to complement its overall looks. 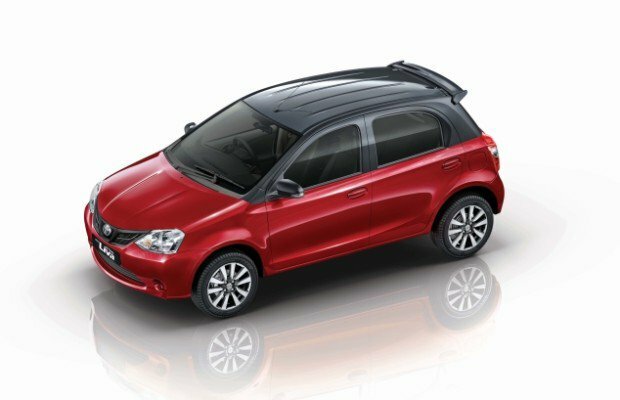 The all new Toyota Liva gets advanced safety options as it is equipped with Standard Dual Front SRS (Supplemental Restraint System) airbags and standard pre tensioner and Force Limiter Front Seatbelts. Under the hood, Toyota Liva remains the same. The car is powered by a 1.2 litre petrol and 1.4 litre diesel engine. While petrol engine with a capacity of 1197cc churns out a maximum power of 80 PS at 5600 rpm and delivers peak torque of 104 Nm at 3100 rpm. The 1.4-litre diesel engine churns out a maximum power of 68 PS at 3800 rpm and delivers a peak torque of 170 Nm at around 1800 to 2400 rpm. Both petrol and diesel engines are mated to a 5-speed manual transmission gearbox.